I started Project Life in January, fully intending to keep it up on a weekly basis. Around the end of February, I decided it might be better to just print photos monthly, keep good notes and still create weekly layouts. Around the end of April, that all fell apart. Last week, I decided I needed to figure out a way to make it a better match for me. Weekly is just too much to work into my schedule. And, honestly, we just don’t do that much. I felt like I was forcing filler that really wasn’t meaningful just to have full layouts. It didn’t feel right. I’m a little bit obsessed with sustainability right now – figuring out ways to make things work for me in the long run. Whether it’s what I eat, how I exercise, kitchen chores, the budget or scrapbooking, I’m focusing on ways to simplify. 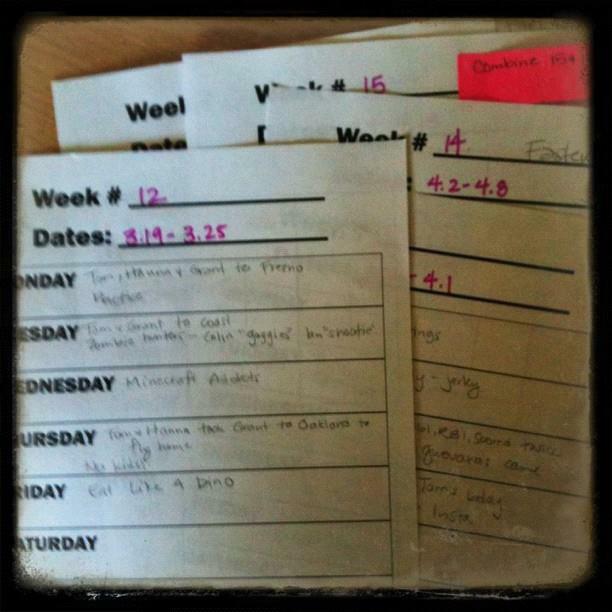 I have weeks one through 17 fully scrapped for 2012, bringing me up to the first week of May. To catch up on the…ummm…20+ weeks I’m behind, I’m going monthly. Except for September. I’ve shared about how rough September was. I have one picture from September. That’s it. I think I’m going to just print out that blog post, put it with that picture and make it a little insert. Those memories are too important not to record, but I’m also not going to stress about coming up with enough for two full pages. For the rest of this year, I’m planning to continue with the monthly plan, using inserts when necessary for busier months. It’s far more sustainable for the time I have to give right now. I’m still deciding what I want to do for 2013. I love the concept of Project Life – it just makes sense. I no longer have a dedicated scrapbook room or even a desk. And I don’t have the hours to focus on it like I used to. Quick and easy are necessities. I’m debating doing an annual album for each of the kids next year along with a family based one, but I’m not sure. I’ve considered going digital for 2013, and printing 3 albums – one for each kid and one for me…but there’s just something about the feel of photos and paper that I love. I’ve got a little time to think about it still. Ultimately, I know that memory keeping is an important part of who I am. After 15 years, it’s not something I can see myself ever fully giving up and I’m thankful for things like Project Life that make it easier. I just need to keep working to figure out the best way to personalize it and make it mine. How do you make Project Life sustainable for you? View all of my previous Project Life posts here.